The data below shows cups of coffee sold at a small kiosk for a week at different hours of the day. The times in column B are valid Excel times. 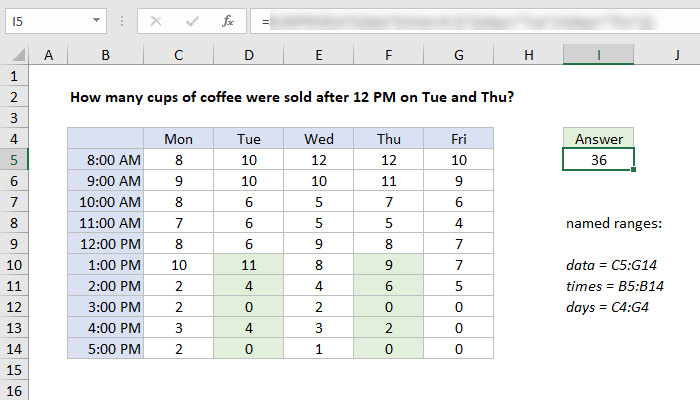 What formula in cell I5 will correctly sum the total cups sold after 12:00 PM on Tuesday and Thursday? Relevant cells are shaded in green. Download the Excel workbook, and leave your answer as a comment below. Your formula should dynamically locate the cells to sum, without hardcoded references. In other words, =SUM(D10:D14,F10:F14) is not valid. Use named ranges when possible to make your formula easy to read. This works because Excel handles times as fractional values of 1 day, where 6:00 AM is 0.25, 12:00 PM is 0.5, 6:00 PM is 0.75, etc. If SUMPRODUCT used this way is new to you, this formula is based on the same idea, and includes a full explanation. SUMPRODUCT may seem intimidating, but I encourage you to give it a try. It is an amazing tool.